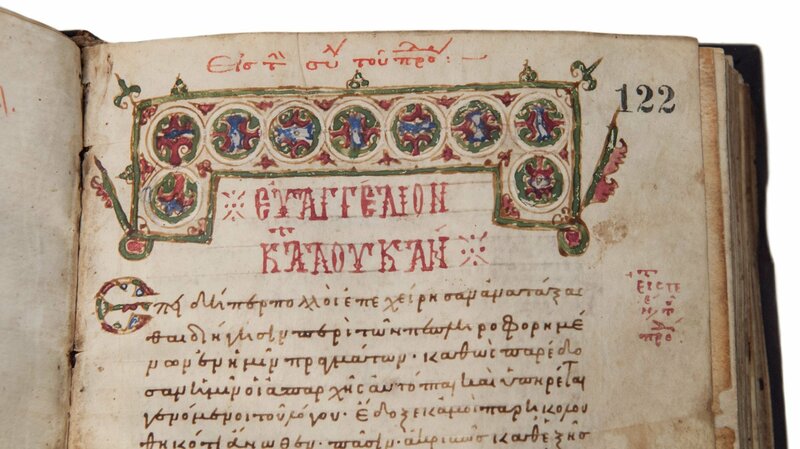 A 12th century Byzantine manuscript, which went missing from the University of Athens in 1991, has been discovered in the collections of the Museum of the Bible, and will be returned to Greece later this year. The Greek manuscript, which contains the four canonical gospels, had been donated in 2014 to the newly-created museum in Washington, D.C. It had previously been owned by handful of private collectors, and had even been sold at public auction. In 2015, Museum of the Bible notified the Institut für neutestamentliche Textforschung in Germany about the manuscript’s new location. This information was then posted to the institute’s public online database of New Testament manuscripts, the Virtual Manuscript Room. The following year Professor Theodora Antonopoulou of the University of Athens discovered this particular manuscript had been mysteriously missing from her university’s library since 1991. After finding information about the manuscript on the German institute’s online database, she contacted Museum of the Bible in March 2018 and began a joint research project with the museum to determine if this manuscript was the missing text. Their findings confirmed it was indeed the manuscript removed from her university without permission. In keeping with cultural heritage preservation practices and best practices as prescribed by the Association of Art Museum Directors and the American Alliance of Museums, the museum will return the manuscript to the university. In a demonstration of the spirit of cooperation between the museum and the university, Museum of the Bible will display and chronicle the history of the manuscript in a temporary exhibit that runs through October 1st. The exhibit is designed to educate visitors about the manuscript, its provenance and Museum of the Bible’s commitment to adhering to cultural heritage laws and museum best practices. In addition, the museum and university have agreed to cooperate in the future on loans of manuscripts for display in the museum. Museum of the Bible will also post high-resolution images of the manuscript on its website, to make the manuscript available for study to anyone.